Leigh Stein is the author of the novel The Fallback Plan and poetry collection Dispatch from the Future. 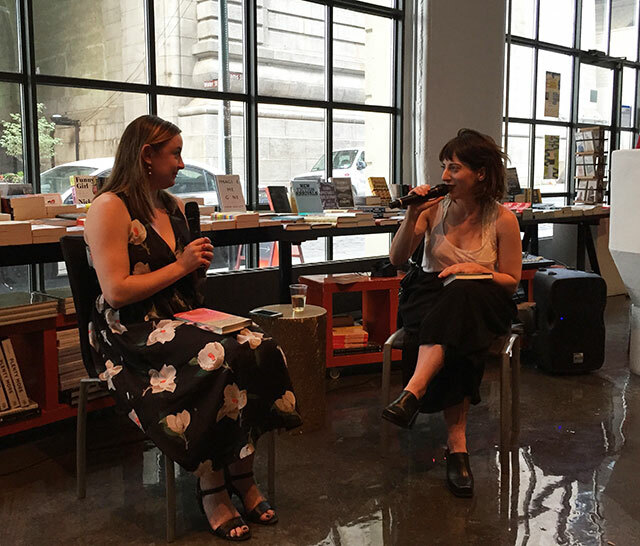 She launched her memoir Land of Enchantment at Powerhouse Books in Brooklyn (becoming the second author to read at the store’s new location on Adams Street). She was joined by Rachel Syme to discuss the memoir. Land of Enchantment chronicles a period in Stein’s life when she lived with a boyfriend, Jason, who in retrospect was emotionally abusive. She eventually split from him, but he continued to persist in her life up until he was killed in a motorcycle accident. Stein didn’t set out to write a memoir. She intended to write a second novel after the success of her hit The Fallback Plan. But she kept sending the characters in the novel to New Mexico. Years earlier, she had relocated there to live with her boyfriend Jason. While Stein was attempting the second novel, she wrote an essay about grieving and read it at a reading series in New York City. The audience offered her positive feedback and she began to think about the issues of grieving in the internet age. “There isn’t a book about how we grieve online,” she says, and so she set about adapting the essay and writing a book about online grieving. Two years of working on that book lead her to realize she was actually writing about her relationship. “Young people want to see their experience in the digital landscape reflected in literature,” she says. Realizing she had been in an abusive relationship was difficult. At the time she was in it, the beauty of her relationship, she explains was believing she was the only person to have experience that kind of relationship. “I thought I was a smart, strong person,” she says, adding she thought she could fix it. In writing the book, Stein ended up doing research, a strange notion given she was writing about her life. But she looked back into her email archive to confirm the things that happened. When Stein first started writing the memoir, Jason was a larger than life character. She thought he was the hero and only later realized she was writing her own story.